"currently have the Intermediate Award (since 1993) for students in grades 4-6, the Teen Award (since 2006) for students in grades 7-8, and the High School Award (since 2014) for students in grades 9-12. For 2015, there will be an Elementary Award for students in grades 2-4. With these additions, The Nutmeg Book Award will be an important part of literacy from elementary school right through high school graduation!" -- from the Nutmeg Book Award webpage. Nutmeg@Night is an annual event held at the Durham Public Library. Students from grades 5-12 AND adults are encouraged to form a team of four, read the ten nominees from the Teen Level, and face-off in trivia contest testing plot recall! 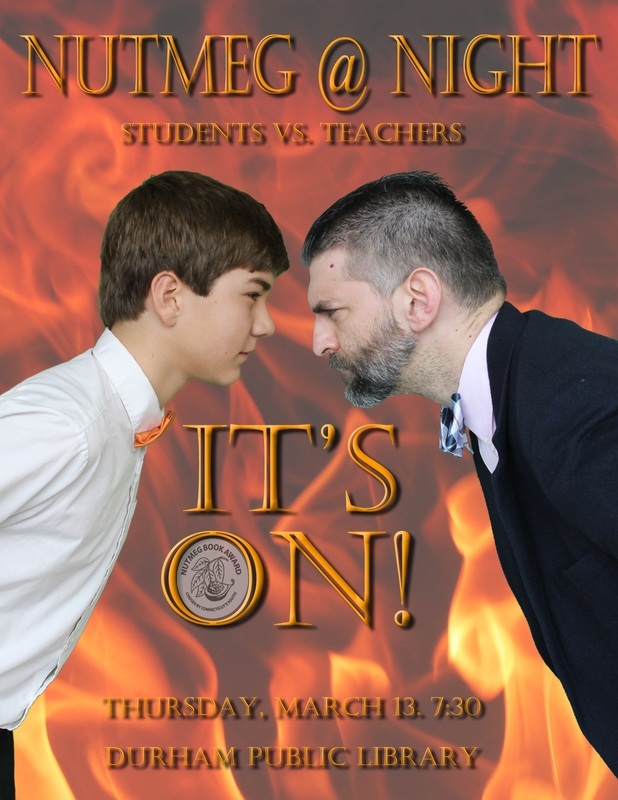 Since 2013, a team from the class of 2018 has challenged a faculty team from Strong Middle School. In 2013, the students bested the faculty team; however, in 2014 a faculty team of Magistra Reddick, Mrs. Rosenthal, and Mr. Klimas returned the favor and defeated the students! Although the class of 2018 now heads off to high school, the Strong faculty team challenges not only that team, but ALL comers, to read the 2015 Teen Nominees and try to unseat them as Nutmeg@Night Champions! Any takers?! Check back here for more information throughout the school year! For a printable PDF of titles with brief plot summary, click the button below.